Femodene is a combined oral contraceptive pill taken by women to prevent pregnancy. Femodene is a reliable and reversible method of contraception. The Femodene contraceptive pill is a prescription-only medication. Femodene is a combined oral contraceptive pill (also known as ‘the pill’) that works to prevent pregnancy. They prevent an egg being released from the ovaries. They make the mucus in your cervix thicker which makes it difficult for sperm to enter the womb. They prevent the lining of your womb thickening, meaning that an egg cannot grow in it. 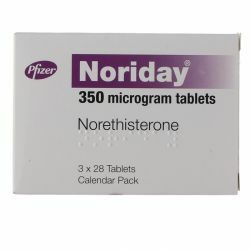 Femodene is a 21-day pill. One Femodene contraceptive pill is taken each day for 21 days, followed by 7 days when you take no pills. It can help with many premenstrual symptoms. Femodene will not protect you against sexually transmitted infections; only condoms can do this. Femodene comes in strips of 21 pills, each tablet is marked with a day of the week. Take your pill at the same time every day, for example every morning or every night before bed. Follow the direction of the arrows on the strip and take one Femodene contraceptive pill each day, until you have finished all 21 tablets. Swallow each pill whole and do not chew it. After you have taken all 21 pills in one strip, you must allow seven days to pass without taking any pills. Within a few days of taking the 21st pill from one strip, you will experience a withdrawal bleed like a period. This bleed may not have finished when it is time to start your next strip of pills, however you should continue with your next strip. You will have seven pill-free days each month with this course of medication, during which it is not necessary to take additional contraceptive medication - if you have completed the course as instructed. You should start each month’s strip of pills on time, even if the bleeding is still occurring on the eighth day after finishing the previous month’s course. The scheduling of the Femodene contraceptive pill has been designed so that every month, the day of the week on which you begin a strip will always be the same. For further information on how to administer Femodene properly, please read the patient information leaflet enclosed in the medicine’s packaging. 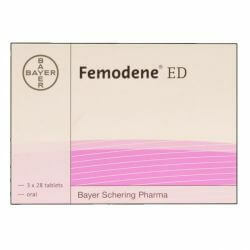 Femodene consists of the active ingredients progestogen gestodene (75mg) and oestrogen ethinylestradiol (30mg), with each pack containing 3 strips of 21 tablets. Other ingredients include: povidone, macrogol 6000, magnesium stearate (E572), lactose, calcium carbonate (E170), talc, maize starch, sucrose, montan glycol wax and sodium calcium edetate. We pride ourselves on being a responsible Femodene UK supplier, and as such, we are committed to providing comprehensive advice on the safe administration on this drug. It is vital that the symptoms of blood clots are understood before taking the Femodene contraceptive pill. This is due to an increased likelihood of blood clots or exacerbating existing blood clot conditions. Such information is available within the patient information leaflet, alongside the positive and negative aspects of taking the medication. Assessing these considerations is a must before opting to begin the course of medication or deciding whether you wish to continue the treatment once you start it. 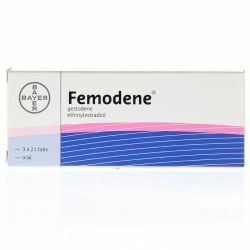 Although Femodene is safe for the majority of healthy women, it can be unsuitable for some. If you have blood clotting in any body part or organ, including deep vein thrombosis (DVT) in the legs or a pulmonary embolus (PE) of the lungs. If you have a disorder which affects your body’s blood coagulation processes, such as protein C or S deficiencies, Factor V Leiden, antithrombin-III deficieny or antiphospholipid antibodies. If you are currently in need of an operation or if your lifestyle demands that you are off your feet for long periods. If you have ever had a heart attack or stroke. If you are currently suffering from or have a history of angina pectoris (causes severe chest pain; can be the first sign of a heart attack) or transient ischaemic attack (TIA). - hyperhomocysteinaemia: a condition which causes very high levels of cholesterol or triglycerides in the blood. If you are currently or have previously been a migraine sufferer, especially if afflicted by a condition called ‘migraine with aura’. If you have or have ever had breast cancer. If you have ever had a severe liver disease, or if your doctor has informed you that your liver function test results are not back to normal levels. If you experience allergic reactions (hypersensitivity) from any of the listed ingredients in the Femodene contraceptive pill. If you have systemic lupus erythematosus (SLE, a disease affecting your natural defence system). If you have haemolytic uraemic syndrome (HUS – a disorder of blood clotting causing failure of the kidneys). If you have sickle cell anaemia (a hereditary disease affecting the structure of red blood cells). If you have recently given birth - due to the increased susceptibility to blood clots during this period. If you have an inflammation in the veins under the skin (superficial thrombophlebitis). If you or your family have a history of heart or circulation problems, including high blood pressure. If you or your close family have ever had problems with your heart or circulation such as high blood pressure or blood clotting. If you have the inherited disease known as porphyria. If you are overweight or obese. If any of your medical conditions worsened during a pregnancy or during previous uses of the pill. St. John’s Wort (an herbal remedy). Femodene contains lactose and sucrose. If you are aware that you have an intolerance to certain sugars, contact your doctor before using Femodene to assess its suitability for you. Do not take Femodene if you are currently pregnant. If you are breastfeeding, your doctor or family planning nurse may advise you not to take this medicine. They will be able to suggest alternative contraception options.